Though praised for its beauty since the times of ancient Greece, myrtle is an herb that offers far more than meets the eye. Myrtle was first grown in the Mediterranean region, and the native populations of Southern Europe and northern Africa use it both for culinary and medicinal purposes. The first records of myrtle usage date back to ancient Greece, where it featured in mythology as a symbol of love and immortality. This belief was also passed on to Rome, where the herb was used in religious ritual. The tradition of having myrtle in a bride's bouquet comes from this source and is carried on throughout Europe even now. Thanks to its pleasant fragrance, myrtle has been a staple of Mediterranean gardens for just as long. Jewish liturgy also mentions the plant as sacred, and it is employed in the autumn festival of Sukkot. Treating bacterial infections. Myrtle's antibacterial properties were used for treating infections, especially tuberculosis, before the advent of modern antibiotics. Relieving cough and respiratory illnesses. Myrtle has traditionally been used to treat respiratory problems due to its ability to open up airways and aid in the expulsion of phlegm. Treating acne. Myrtle can be used to treat a number of skin conditions, especially acne. Myrtle also has been observed to have bronchodilator, antispasmodic, antihyperglycemic, and anti-inflammatory properties, though these have not yet been linked to any specific constituents. The monoterpenes in myrtle leaves have an antibacterial activity against Mycobacterium tuberculosis, and this is thought to be due to the combined action of these nutrients rather than just a single compound. Myrtle leaves contain three monoterpenes, limonene, cineole, and alpha-pinene, which are sometimes collectively referred as myrtol. These compounds have antibacterial properties. Additionally, cineole in myrtle essential oil is responsible for its expectorant, mucolitic, and decongestant action. Other herbs with antibacterial and expectorant properties are eucalyptus and mullein. Very little research has been done regarding the medicinal value of myrtle. However, overconsumption of myrtle can lead to asthma-like attacks, as well as nausea, diarrhea, vomiting, upset stomach, lower blood pressure, and blood circulation disorders. Children, as well as women who are pregnant or breastfeeding, should not take myrtle, since it can cause breathing problems or even death when consumed in excess. Myrtle essential oil is also unsafe at doses exceeding 200 mg for adults and extreme caution should be exercised when consuming it in this form. 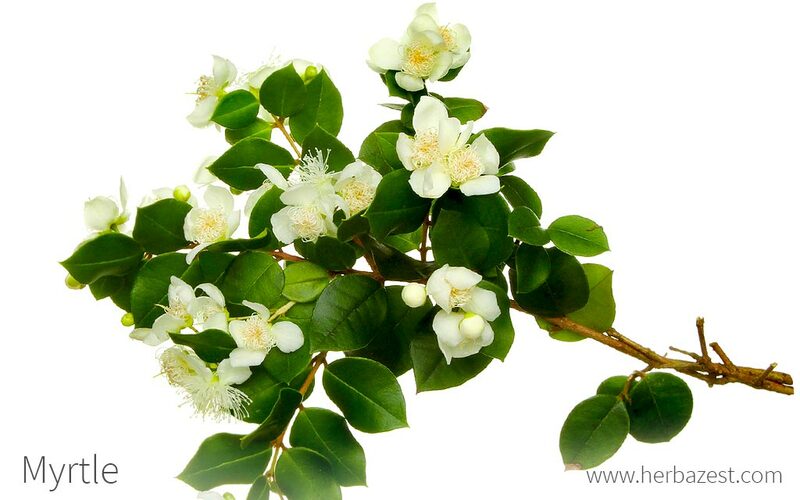 While myrtle is occasionally used for culinary purposes, the most effective way of obtaining the health benefits from myrtle is in medicinal forms of consumption, where the properties are more concentrated. Infusion. Myrtle-infused hot teas are one of the safest ways to consume this herb. When taken as an infusion, myrtle works as an expectorant, helping to relieve congestion by expelling mucus from the respiratory system. When taken as an infusion, the dosage of myrtle leaves should not exceed 50 to 60 grams per liter of water. Tincture. When prepared as a tincture, myrtle's antibacterial properties make it useful for alleviating bacterial infections, such as bronchitis. Essential oil. Due to its high risk of side effects, daily use of essential oil should not exceed 200 milligrams per day. If using essential oil medicinally and in extreme moderation, it can be used to alleviate respiratory ailments due to its high concentration of expectorants. Full myrtle plants are easy to find in many garden stores and nurseries due to worldwide popularity. They can grow to be quite large, and are therefore usually bought as seeds or young plants meant to later reach peak sizes. Leaves for tea can be found in some specialized health stores, as well as online. Remedial forms myrtle are difficult to find, even from online retailers, who tend to be the most accommodating sources for specific needs. Herbal preparations based on myrtol are available in Europe. Well-accustomed to a Mediterranean climate, this evergreen shrub is also a delicate herb. So great care is needed in order to help this plant thrive. Seeds or young plants must be kept in a sheltered environment for initial growth during late spring. Myrtle thrives in well-drained soil, which must remain moist at all times. Fertilizer should not be used in winter months. Young plants should be re-potted every one to two years. Older plants every three to four years, and ideal temperatures are around 60 - 64°F (16 - 18°C), though a few days of frost will not kill the herb. Technically a shrub, this plant is sometimes classified as a small tree, because it can reach heights of up to 16 ft (5 m). Its star-like flowers are usually white with numerous stamens, and its fruit is a round, blue-black berry. The essential oils present in the leaves give off its signature aroma. Myrtle, or Myrtus communis, is a member of the Myrtaceae family, which comprises approximately 155 genera and 3,000 species of mostly aromatic woody trees and shrubs, such as allspice (Pimenta dioica), camu camu (Myrciaria dubia), guava (Psidium guajava), and cloves (Syzygium aromaticum). The Myrtus genus encompasses only two species: the widespread Myrtus communis, or true myrtle, and the lesser-known Myrtus nivellei, or Saharan myrtle. The latter is grown only in the very restricted woodlands of the Tassili n'Ajjer Mountains, near the center of the Sahara Desert, and it is listed as an endangered species. The differences between true myrtle and its Saharan counterpart are so slight, however, that its distinction as a separate species is under debate. As of present, M. communis is divided into two subspecies, communis and tarentina. Because of its elegance and pleasant aroma, myrtle trees were common in ancient Roman gardens. They were even presented to Roman elites as gifts once they were settled into a new home, if that settlement was near the Mediterranean Sea, where the plant best thrives. Due to its multipurpose nature, myrtle is cultivated globally, mainly as an ornamental plant and for the timber industry due to the density of its wood. Large-scale production is most prevalent on its native European shores, with Germany alone generating an estimated $18 million in 2012 for culinary and medicinal use. Herbal traditions throughout China also put the plant in high demand, though in other parts of the world, myrtle growth is more modest, but it still sells well as a garden shrub or for alternative therapeutic remedies. Myrtle is one of many herbs that are mentioned in the New Testament of the Christian bible in the book of Isaiah and was considered a sacred plant. Myrtle twigs, together with palm branches and twigs of willows, are still used in the ritual of the Feast of Tabernacles. Gardening. As a powerful aromatic, myrtle has graced the gardens of many around the world for aesthetic and ornamental pleasure. It has even garnered the esteem of Britain's Royal Horticultural Society, winning their Award of Garden Merit. Drinking. A regional liqueur, made exclusively on the Italian islands of Corsica and Sardinia, is made from macerating myrtle berries into alcohol. Germplasm Resources Information, Taxon: Myrtus communis L.